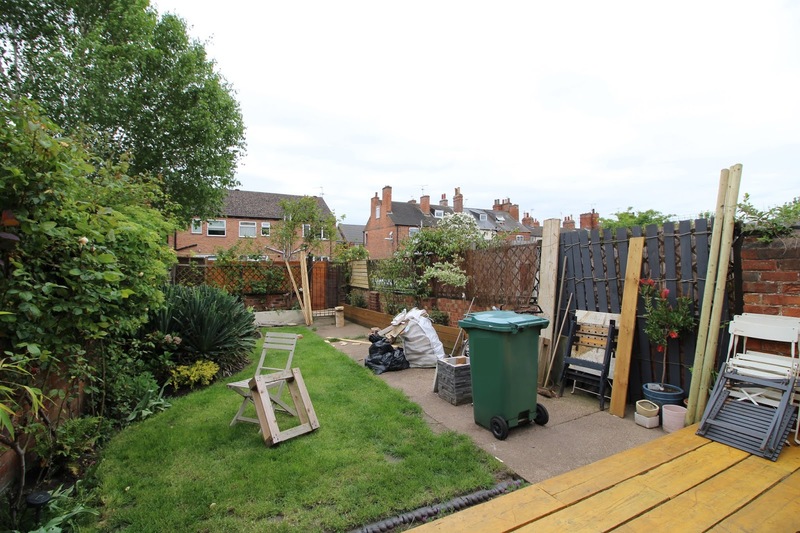 We've now been working on our garden renovations since we moved in, back in 2014. I ripped apart the entire garden in a matter of weeks; and since then we've transformed it with a new lawn, a pallet sofa with firepit, scaffold decking and most recently, slat fencing. (You can check out all my garden reno posts here) But as a whole, the garden is still far from finished and the biggest eye-sore has been the old concrete path that runs the length of the garden. The plan was initially to use part of the path as a lower-patio against the decking for a sit-down area of table and chairs. Then, reduce the width of the rest of the path for a wider lawn instead. I had always envisioned some beautiful dark limestone slabs, but, the cost of this would have been insane. Spending that much money just didn't seem right when half our house is incomplete, and despite my best interests of finding something cheaper, or secondhand, it just didn't happen. So - along came the idea of gravel. Gravel requires little-to-no extra materials, it's inexpensive to buy and can make an instant transformation in a matter of minutes. The negatives, however, are that the dogs are likely to kick it all over the place, it's not an easy material to sweep leaves and other debris from, and you obviously can't walk on it barefoot (oh first world problems!). But, after searching the hashtag #gravelgarden on Instagram for hours, I was completely sold on the idea. Especially as we could buy a large bulk bag and use the extra around the pallet seating corner too, which has been unfinished for the last 3 years. The positives far outweighed the negatives, and it just made sense. So that's what we did. The gravel we used in our old house was Cotswold Chippings, which is a fairly consistent shade of light cream and has quite a modern feel to it. Despite really liking them, they did go a little green in places over the winter and I wanted to do something different in this house anyway. This time around, I wanted something with a more mix of colours to it, but at the same time still light and modern. I found a few websites that offered gravel samples, but the one that stood out as the most affordable (some websites wanted to charge £5 per sample, would you believe?!) along with reasonable prices for bulk bags and delivery, was The Stone and Garden Company. I ordered two samples to keep my choices minimal and I eventually decided on 20mm Yorkshire Cream, which is shown as B in the photo below. The other one in this photo is a 20mm Quartz. 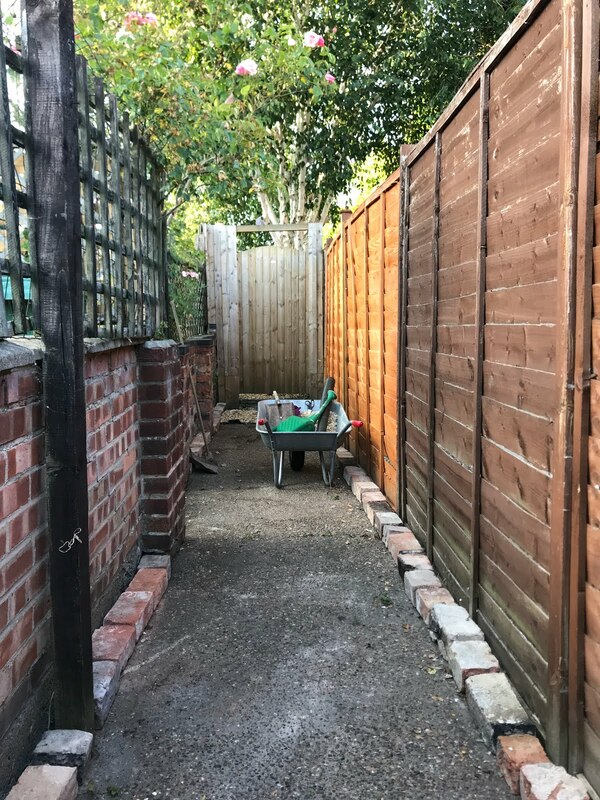 The first step to gravelling the garden was to fit some kind of edging around both the pallet seating corner and lower-patio area so that the gravel would be partitioned from the grass. The last thing we want is gravel all over the lawn (and the dogs are certainly prone to kicking it about!) so a good edging will help against that. For the pallet seating corner, I re-used some of the original Victorian Edging tiles that were in the garden when we first moved in. Some of them aren't in the best condition and I've had to mix and match slightly, but I figure it all adds to that period charm. I've also used some leftover bricks with them too, just because I like the look of it. I think it works and looks really good! I'll give you a quick talk through the process, but it was seriously simple. Like, zero DIY skill involved. I laid the bricks out in the rough shape I wanted to create, then used a string line to properly mark it out. A string-line will help to keep you keep going straight when it comes to putting it all together. Then, I simply dug a trench to slot both the edging and bricks into. Simple! Finally, I back fitted the gaps with mud and voila, one reclaimed brick edging! Not bad huh? As for the patio area, I wanted something a little less decorative, so I decided to use a gravel board instead. It's super cheap and once fitted is barely noticeable. I fit the gravel board in exactly the same way, digging a trench and slotting it in. Super simple, although both areas did take a couple of hours to do. I see so many people just chucking gravel down willy-nilly here and there and in a matter of weeks, weeds are popping up all over the place. You can lay gravel down on-top of anything, but if you want a decent finish that won't turn into a weedy-hell, you do need to prepare the area first. If you're laying gravel onto soil or cracked concrete where weeds may grow, I thoroughly recommend using landscaping fabric underneath first as this will completely block out the light to them. We always use the heavy-duty landscaping fabric because it's far more durable, which is really important when using under gravel as normal weed fabric will tear and rip apart within a matter of weeks. And don't worry - it's completely permeable so it won't turn into a swap either. You can peg the fabric down into the soil if you'd like, but otherwise, the gravel should hold it into place, so all you need to do, is cut to size and lay. Here's Doug modelling it fabulously. We ended up ordering an 850kg bulk bag of Yorkshire Cream gravel from The Stone and Garden Company, as I mentioned earlier, for only £85 (and including free delivery would you believe?!) which meant we had a lot to sift through. Since our garden also has no access for pallet wheels, we had to have the bag delivered to just outside the back gate, on the adjoining road. So, we borrowed a wheelbarrow from Grants parents so we could easily transport the gravel from the bag to the garden, without taking years to do. We used a spade to fill the wheelbarrow up and then simply dumped the gravel where we needed it. I then used a scrap piece of wood to spread it around and make sure it was all fairly level. Our concrete is actually on a slope, so we've worked with that. 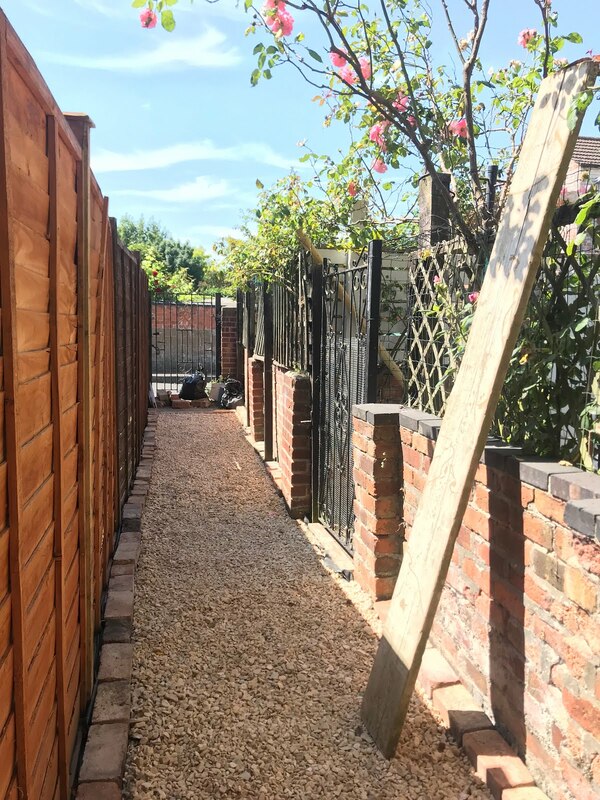 For years this alley has been used as a dumping ground, so laying gravel here has made even more of a transformation than it has in the garden! Grant uses this alley almost daily for his bike, so it feels good to finally have it cleared out and prettied up. We plan on adding some solar fence lights in the future (Lights.co.uk have some particularly affordable ones I'm eyeing up!) and painting and repairing some of the fences too. But the later is probably a job for next year! I am dead chuffed with how it looks, and I think it works really well. Sure, it's no limestone paving slabs - but you know what, I think it's a good rival! So, Would I recommend Gravel? OK, so cards on the table. The dogs have kicked it into the grass twice so far (UGH!) and twice already leads me to believe it will happen again, and again. So yes, that is flipping annoying and one of the biggest negatives to gravel. The pallet seating corner is already beginning to stack up with leaves and petals from the rose bushes which obviously I can no longer sweep away and will it soon turn into a leafy mess-pit I can't control? Only time will tell. And lastly, let's talk about the neighbourhood cats. Someone on Instagram warned me that cats love to use smaller sized gravel like a litter tray. I took note and avoided shingle type gravel - this one has much larger chunks within it. But guess what? I've already cleared up three lots of cat poop from the back alley! And it's certainly is not from the dogs, so yes, that is also another huge negative. I mean, who really want to pick up more poop?! BUT, all things considered, yes I would definitely recommend gravel. After all, if you're on a budget, it's the most budget-friendly quick-solution out there. There is literally zero hassle when it comes to installation and it's so bloody affordable! Let's face it - there's a reason we've used gravel twice now. I'm definitely pleased with it - I personally think the positives outweigh the negatives, and you know what, if I ever can afford those limestone paving slabs for the lower-patio one day, this won't have been the biggest waste of money. We just need to sort out the rest of the path now... but I reckon that might be a job for next year. Watch this space! None, although we borrowed a wheelbarrow. Hey There. I found your blog using google. This is a very well written article.